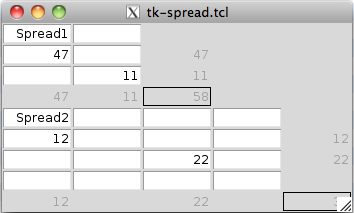 A small Spreadsheet implementation, originally developed by Richard Suchenwirth in plain Tcl (see http://wiki.tcl.tk/1287). The spreadsheet was rewritten in an object oriented manner as a design study in NX by Gustaf Neumann in May 2011. # The SpreadSheet computes simply totals for rows and columns. # cell to a value.